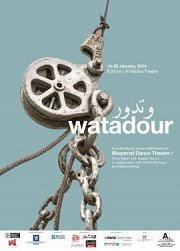 Omar Rajeh and Maqamat Dance Theatre, in collaboration with Nasser Soumi, Sharif Sehanoui, and Mazen Kerbaj, presents: "Watadour" (It Turns), a dance performance with six artists and a moving circular stage. “Watadour” plays around the idea of ‘the impossible’, the nearly unbelievable and absurd situations we encounter in our everyday life. Omar Rajeh collaborates with Nasser Soumi, Sharif Sehnaoui, Mazen Kerbaj, Bassam Bou Diab, and Mia Habis to confront the question of ‘adaptation and survival’, which seems to be continuously present in our physical and mental being. Everything moves, changes, and shifts around us, a turmoil of human, social, religious, and political conflicts. 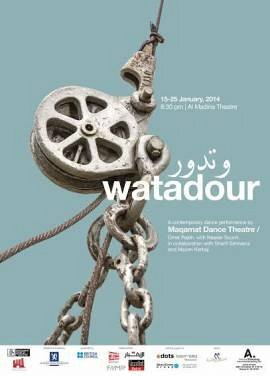 “Watadour” is about coping, adapting,acting, and surviving an insecure and continuously hostile environment. It is a dual dance shared by two dancers and a moving circular stage with live music and live visual projections. The stage will gradually move from a horizontal position to a completely vertical one. The dancers will follow, adapting their bodies and their movements, and acting along the sloping position of the disc. They will be confronted immediately by the disruption of gravity and the idea of verticality Vs horizontality. The performance reflects our strong drive for ‘being’, which is a dual struggle between physicality and virtuality, and their ‘becomings’.